MANILA, Philippines — Alibaba founder and executive chairman Jack Ma looked upbeat after a meeting with President Duterte at Malacañang yesterday despite reports that he complained of the slow internet connection in the country. Duterte and Ma talked about bringing in platforms to boost the mobile technology, internet banking and e-commerce industry in the Philippines, officials who attended the meeting told The STAR. Noting the slow local connection, Ma also expressed interest to help boost internet services for the Philippines. “Perfect! Excellent meeting,” Ma told reporters at the Palace grounds when asked how his meeting with Duterte went. Accompanied by Finance Secretary Carlos Domiguez III, Sen. Richard Gordon and government officials on his way out of Malacañang, Ma posed for selfies with star-struck guests who were also passing by the main entrance to attend other events yesterday. “It was very good,” Ma said between the taking of photographs. During the meeting, Duterte underscored the importance of technology in helping develop the economy. Noting Ma’s rags-to-riches story, Duterte also told Ma that it took him seven years to graduate from high school and that he was an ordinary student all throughout his younger years but he eventually got a law degree and became President. Duterte also narrated that he has not been tech savvy and has only lately started to text. Ma, a former school teacher turned technology giant in China, expressed his intent to invest in the Philippines by tapping the youth using internet and mobile service as a platform for free trade. 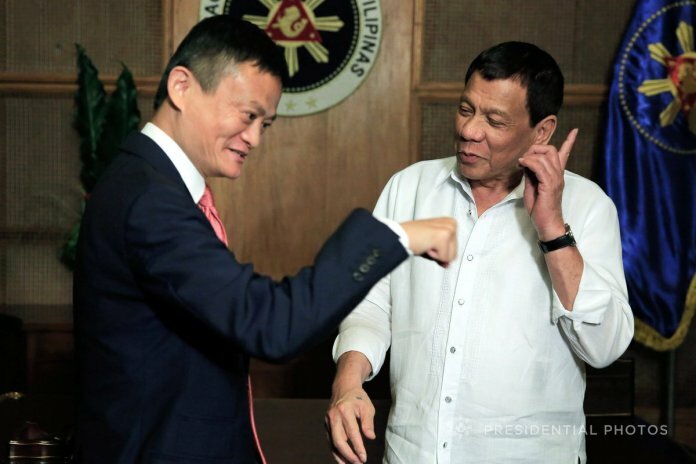 In an interview, Gordon described the meeting as “very good,” adding that the Chinese billionaire spoke with vision by involving young people as he gears up his companies for expansion to the Philippines and the rest of the world. Ma also discussed how his firm’s third party mobile and online payment, Ali-pays, can be expanded in the Philippines. Apart from this, Ma said he is open to expand e-commerce in the country through Alibaba.com, which provides consumer-to-consumer, business-to-business and business-to-consumer sales services via web portals. Duterte and his economic team were receptive to Ma, who said that products made in the Philippines could be traded through the internet platform. “He will provide platform, which can be used by small entrepreneurs and the young people,” Gordon said, adding this would bolster the senator’s plans to further expand economic and free zones in Clark, Subic up to the Aurora Pacific Economic Zone and Freeport. Ma also advocated the use of mobile applications to open bank accounts to make services available to a wider audience, especially the youth, Gordon noted. ‘’Artificial Intelligence has overtaken manufacturing,” the senator quoted Ma as saying during the meeting with the President and his economic team. Some members of the party of Gen. Chang Wangquan, Minister of National Defense of the People’s Republic of China, also took the opportunity to have their pictures taken with the richest man in the mainland. Chang had a scheduled courtesy call with the Chief Executive at 5 p.m.
Ma is in the country to accept an honorary degree from De La Salle University. It was not the first time that the Alibaba founder visited the country since he was also a guest speaker during the Asia-Pacific Economic Cooperation CEO summit in November 2015.